Did you attend NeoCon 2012? You probably noticed that healthcare workplaces represent one of the fastest growing and most innovative segments of the contract furniture industry. Herman Miller, Steelcase, and many other leading manufacturers are spending lots of R&D and marketing money positioning themselves as experts in this space. They are doing extensive research into what both patients and providers want in healthcare furniture. Pieces that are ergonomic and easy to clean are generally at the top of the list. Privacy is also a major concern – above and beyond the basics required for HIPAA compliance. That’s where OBEX products could help in retrofitting existing healthcare workspaces. The administrative and admitting areas of healthcare organizations are a prime space to install our panel extenders to block sound and ensure more visual privacy. For example, even a patient sitting down to discuss or dispute an invoice with a billing representative might not want their conversation overheard. 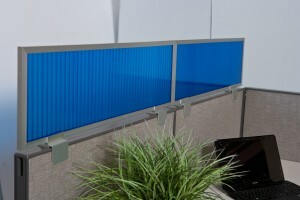 Having workstations equipped with acoustic panel extenders can help prevent sound from traveling. The Sound Transmission Class (STC) rating is what you want to look for in these cases. It’s not just the material itself that makes a difference. The higher the divider, the better it will be at limiting sound “leakage”. In the same way, someone filling out all their personal identifying information at admitting might want to keep those details away from prying eyes. Having a check-in table or bench style worksurface installed along one wall in the waiting area would provide a flat surface so patients don’t have to balance a clipboard on their knees. It could be equipped with multiple desk-top mounted privacy panels to create small, private spaces for completing paperwork. The polycarbonate panels in aluminum frames would be ideal for this setting since they can be easily sanitized.